Here is some ephemera from late summer of 1862, when Confederates commanded by Henry Heth threatened the City of Cincinnati, then the 6th largest city in the United States, and an important Union supply area. These couple of weeks became known as the Siege of Cincinnati, which I have mentioned several times before, in whole or in part. 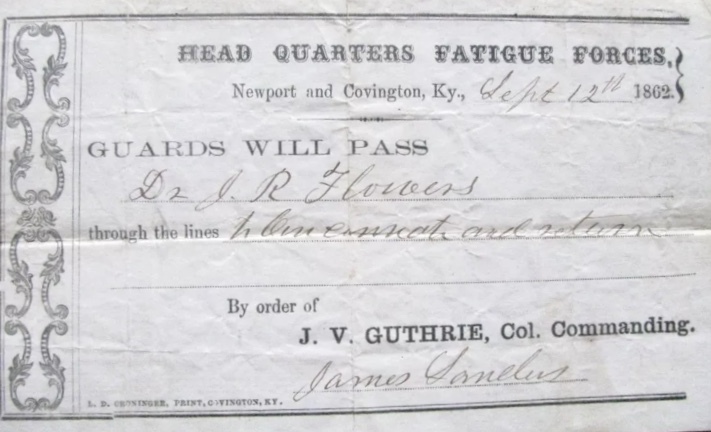 Dr. John (J.R.) Flowers was a private citizen at the time of this document, but officially enlisted into the Army as an Assistant Surgeon in the 52nd Pennsylvania Infantry on December 15, 1863. He was promoted to Surgeon on March 23, 1865 and mustered out with the unit on July 12, 1865 in Harrisburg, Pennsylvania. Not related to him, but an interesting note on Wikipedia (I know, I know, but it does cite sources. Still take this as seriously or not as you wish.) about the unit he joined states that the regiment had been in South Carolina, where the 52nd Pennsylvanians were on hand to witness the ill-fated, but intensely courageous, July 16, 1863 assault by the 54th Massachusetts on Fort Wagner, later recounted in the 1989 Academy Award-winning film, Glory. They then participated with other Union troops in the subsequent siege on the fort from mid-July through early September, at which point CSA troops abandoned the fort. This pass allowed him to move through the defensive lines in northern Kentucky (behind Covington and Newport, the two largest cities in northern Kentucky) and across the Ohio River to Cincinnati and back. This image from Pinterest shows the approximate locations of the defensive positions overlaid on a map of modern towns and roads. I just saw this map and it is a quite handy overview. It at least shows the relation of the defenses of Cincinnati to the city itself, giving an idea of where this pass allowed the doctor to go. If this is the same man (this pass came with typed notes showing the same information as I found about Dr. Flowers) questions about why he was in the Cincinnati area in 1862 are valid. Was he an aide-de-camp or other volunteer for one of the units there, or was he there as a civilian for some reason? Perhaps future research or someone who reads this will find these answers, but this document remains but a small reminder of the military presence in the region during that time.